The code has been tested using SICStus Prolog (4.2+) on Linux. To use the optional visualization of solutions, you also need graphviz. Download the source: abagraph.tar.gz. Unzip and untar it somewhere. Make sure the BASH abagraph script from 'scripts/' is somewhere in your PATH. Edit two variables at the top of the script to point to the right places. The solution will be printed on screen, and 'X' bound to an internal representation of it. Printed on screen is the Proponent argument graph (PGRAPH), the defence set (DEFENCE), the set of Opponent argument graphs (OPGRAPHS), and the culprits (CULPRITS). StratList has the form: [T,OJ,PS,OS,PR]. 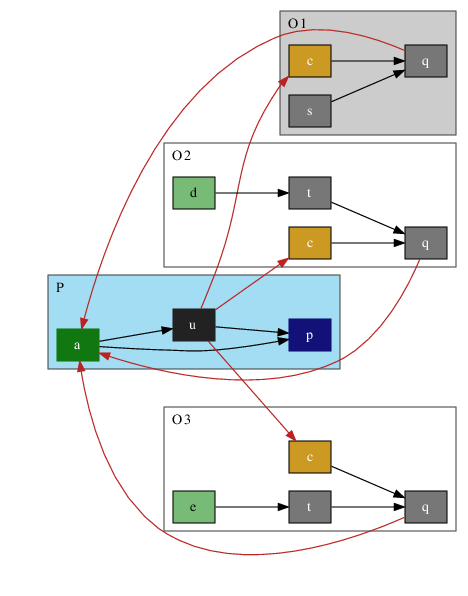 Proponent argument graph shaded blue; marked Opponent argument graphs shaded grey; unmarked (non-empty unmarked support) Opponent argument graphs shaded white. Defence set green. Culprits yellow. Attacks in red.